Smoke and heat exhaust ventilation systems are natural or powered systems to remove smoke from a building allowing low level escape routes to be kept clear of smoke and reducing damage to the building. These elements are regulated by the standard UNE EN 12101-2 which requires the CE marking and passing a series of thermal resistance tests, effective smoke evacuation surface, ability to withstand snow and wind loads, etc… which allow us to make some calculations by the UNE 23,585 to know the dimensions and the number of necessary elements to place, to maintain a free smoke layer that allows evacuate, to see where is the source of the fire and control the temperature of that smoke layer to prevent the collapse and the flashover of the cover. 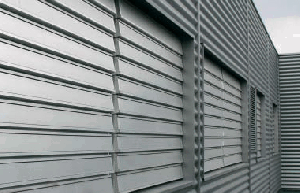 There are many types of smoke ventilation systems: Gate type, double gate type, window type, slats, etc. But we’ll focus on the last one and specifically in our model LAM. It is the type of smoke ventilation system most commonly used because of their excellent performance both in terms of finishing, sealing and resistance to extreme weather conditions. It is made of aluminum which gives it a high level of durability and lightness. It also has a high coefficient of smoke evacuation, allowing us to reduce the number of smoke ventilation systems needed in the installation and its economic impact. Regarding other smoke ventilation systems such as gate type, it has two main advantages, the mechanical strength of the planks that prevent the fall of persons who are working on deck as well as an excellent performance and resistance to the wind when they are open. This point is very important when the user of the system need to ventilate. If a gate type smoke evacuation systmes gets a strong gust of wind while it is opened, they will damage the locking mechanism or even worse, it may end up destroying the gate and flying out. Furthermore, this smoke ventilation system has the opportunity to be done with aluminum slats or cellular polycarbonate that we will allow the light to enter to give us an additional thermal protection. It also has the ability to be installed on the deck and in front considering that when it is installed on the façade it must provide we need to take into account the possibility of headwinds. In order to prevent this situation, you have to double the number of devices needed and place them in two opposite façades with the economic over cost it is. In conclusion, the LAM is an excellent team of high performance and quality that makes it the best choice for industrial buildings such as shopping malls and busy public places requiring the C.T.E. DB-SI and Fire Safety Regulation in Industrial Establishments (RDSCIEI).